Kalimpong: Kalimpong will showcase its floral treasure at the two-day tourism festival in December-end with an intention to woo visitors who have been shunning the hills following the over three month-long unrest earlier in the year. The Kalimpong-leg of the festival will be held on December 29 and 30 and will feature a host of events, including exhibitions, cultural items and adventure sports. "Tourism business is really down since the strike. If we were to compare tourist arrivals in December last year and this year, there has been a fall of 95 to 98 per cent this year. By organising the festival, we want to convey the message that peace has returned to the hills and all are welcome," said Sonam Tsewang Bhutia, the president of the festival organising committee. The festival, like in Darjeeling, Kurseong and Mirik, is being organised by the Gorkhaland Territorial Administration (GTA) with the support of the state government. Bhutia said unlike in the previous years, events would also be organised in far-flung areas of the district like Pedong and Jholung. "We want to organise it in a different way this time. Since Kalimpong is famous for its flowers, we will be giving priority to it. We will be displaying various flowers in stalls. We will also be putting up a pictorial history of Kalimpong," he said. Kalimpong has around 50 flower nurseries and is considered the floriculture hub of the region. Experts liken the place to a natural green house where different kinds of plants from cactus to pine are grown. "Cactus and pine apart, bulbous plants like gladiolus, amaryllis, and indoor houseplants like bromeliads, philodendron species, palms and ferns are also grown in Kalimpong," said a floriculturist. Other events lined up include the usual cultural and musical jamborees, food festival and adventure sports for the thrill-seekers among the visitors in the form paragliding and white water rafting. "The fine details of the festival are still being worked out. The plan is to get some famous cultural and musical artistes to perform at the festival. We will advertise the final programme details as and when they are ready," said a member of the organising committee. 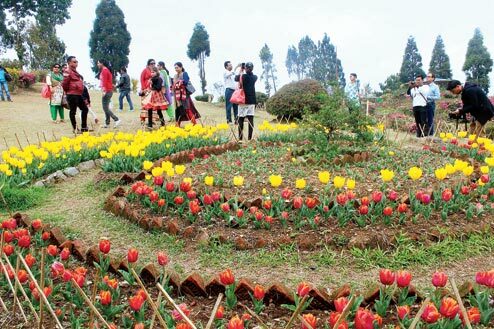 Kalimpong will showcase its floral treasure at the two-day tourism festival in December-end with an intention to woo visitors who have been shunning the hills following the over three month-long unrest earlier in the year.